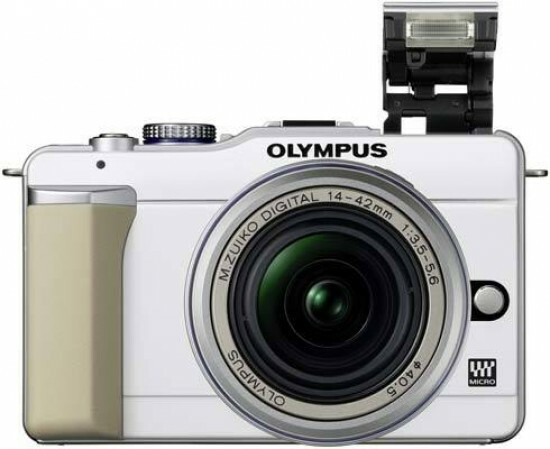 The Olympus EP-1 is a largely successful attempt to bring smaller, DSLR cameras to the mass-market, providing an ideal upgrade path for compact camera users who may be intimidated by the size and complexity of a DSLR. The drive towards simplicity and cost may put off more experienced photographers who would be better served by the premium E-P2 model, although the E-PL1 still offers most of that camera's core functionality. Importantly for the target audience, the E-PL1 is the first PEN to feature a built-in flash, very neatly implemented with a folding design that raise the unit above the lens and helps reduce red-eye. The new Live Guide is another beginner-friendly addition that makes understanding and changing apertures and shutter speeds to achieve creative effects very straight-forward indeed - simply move the slider and observe the effects live on the LCD screen. Other key changes include using the navigation pad to change most of the camera's key settings and the removal of more advanced buttons like AEL and ISO, making the E-PL1 better suited to compact camera upgraders than to DSLR shooters looking for a more portable second camera. That said, the E-PL1 certainly offers most of key photographic features, with only the top shutter speed of 1/2000th second and ISO speed of 3200 proving limiting. No corners have been cut when it comes to image quality, with the E-PL1 offering the best image quality that we've yet seen on a Four Thirds camera, just like the E-P1 and E-P2 before it. low-light performance up to ISO 1600 is very good, offering comparable quality to an entry-level APS-C DSLR, despite the smaller sensor size. The noise reduction is more aggressive by default on the E-PL1 than the other two PEN cameras, but you can change this if you don't like the out-of-the-box results. In terms of movie recording, the E-PL1 is actually one of the most capable Four Thirds cameras despite its budget price-tag, with 720p HD quality, full manual control, a handy one-touch record button and the much-prized ability to add an optional stereo microphone. Only the large file sizes and limit of 7 minutes in HD mode detract from what is otherwise a great performer. The only notable fly in the ointment for the E-PL1 is the half-a-second wait when focusing, something that also hampers the other PEN models. It's a long enough delay to miss that decisive moment, leaving you cursing as the lens zooms in and out before finally emitting the confirmation beep. As you'd expect, performance is quicker with a prime lens, but the E-PL1 ultimately suffers in comparison to the Panasonic Micro Four Thirds cameras and any DSLR that you care to mention.